How do you judge the success of a trip: by the souvenirs purchased, the number of photos on your phone, or the number of posts on Facebook? For me, it is the feeling that remains in my heart upon returning home. When I started as a travel writer in 1998, I would go out of my way to buy souvenirs during my work trips. But now, I simply collect memories. 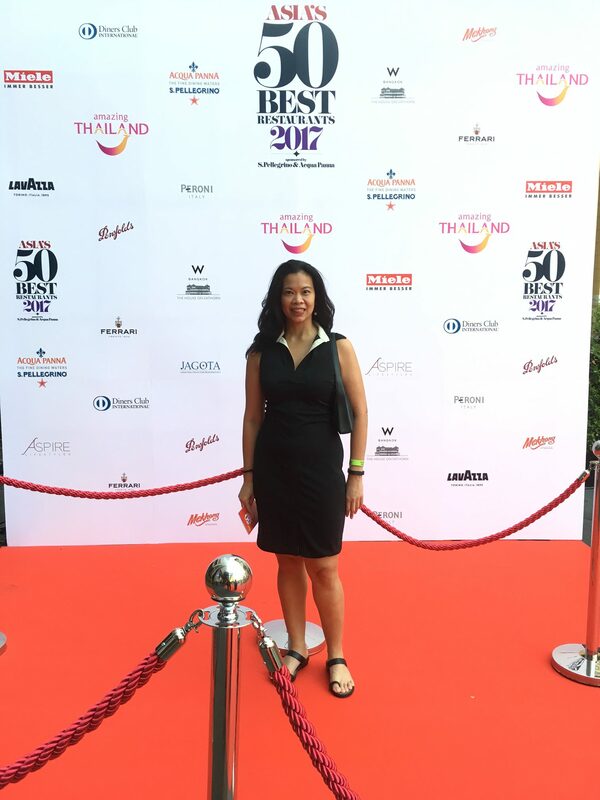 My recent trip to Bangkok was to cover Asia’s 50 Best Awards. I have been covering, what can be deemed as the Oscars of the restaurant world in Asia, for four years now. In 2014 and 2015, it was held in Singapore. But last year and this year, Bangkok hosted the Awards. As an annual event, it has become a reunion of sorts for Asia’s top chefs and the select media covering this event. Gaggan on his Three-peat win! 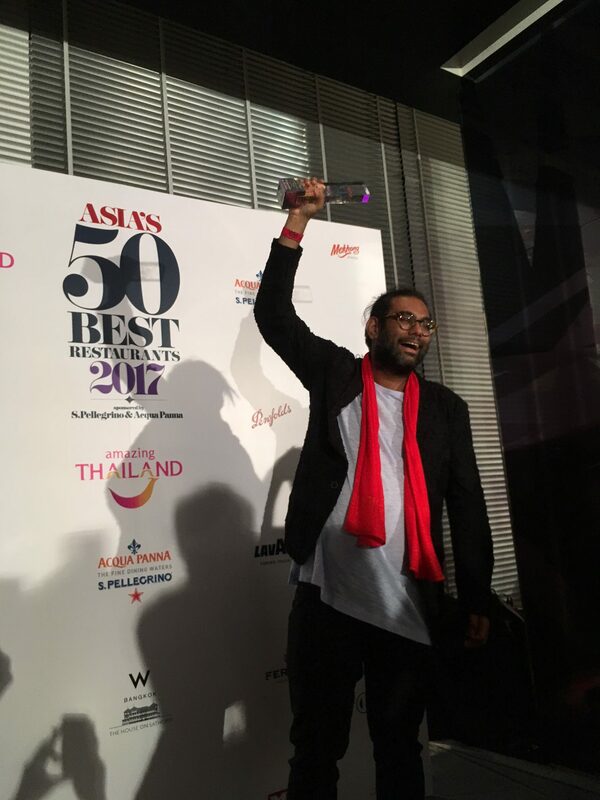 No surprise for me, Gaggan took in the top spot as Asia’s Best Restaurant for the third consecutive year. 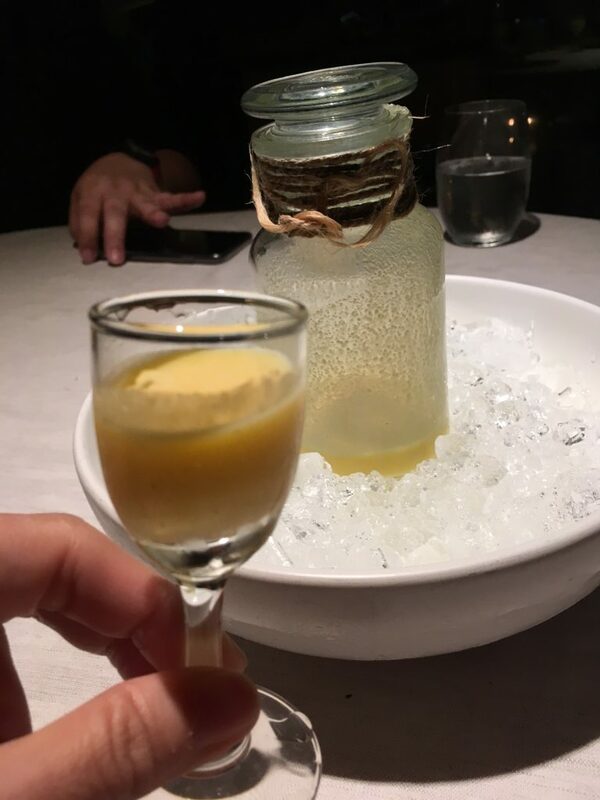 Gaggan is both inventive and skillful, and constantly challenging himself to innovate (see my experience dining there). There were several new entries to the list, several climbers, and a few drops. Find my coverage of the event here. 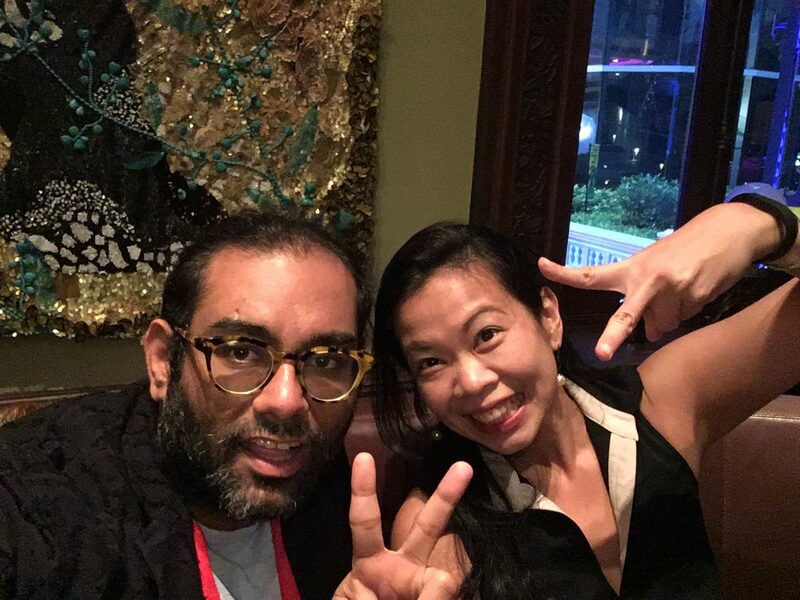 An interview and selfie with Gaggan, always goofy, he insisted we pose this way! Food writers know to pack in as many meals as we can with every trip. But older and wiser now, I no longer scramble to dine at all the must-go to restaurants. Instead, I honor my body and feelings to experience places that resonate with me. I choose dining experiences I feel I would truly enjoy. 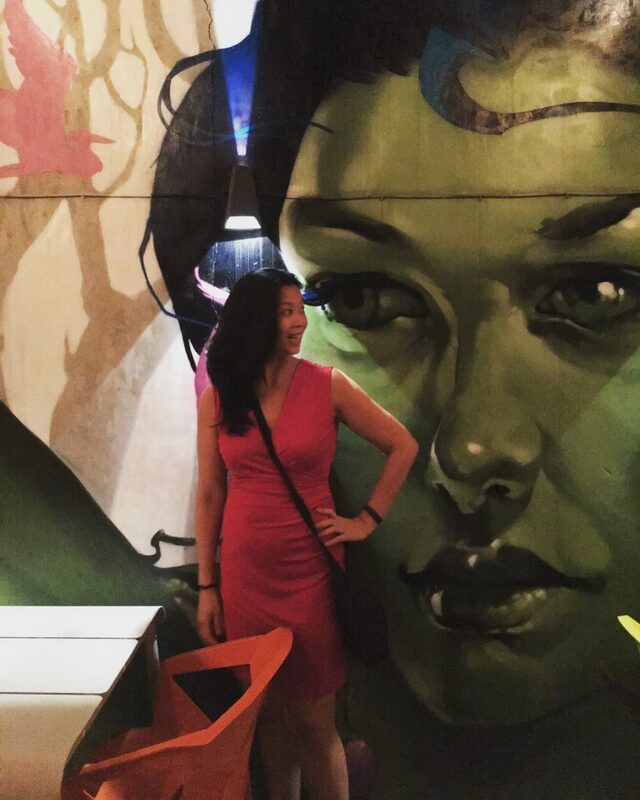 As a result, I returned home to Manila feeling not just nourished by food, but having genuine interactions with the people I spent time with. It is such a blessing to have friends everywhere. I met my friend Charles in Singapore, but we became fast friends during my Bangkok visits. We are both passionate about food, fitness, and the number of steps we log in daily. 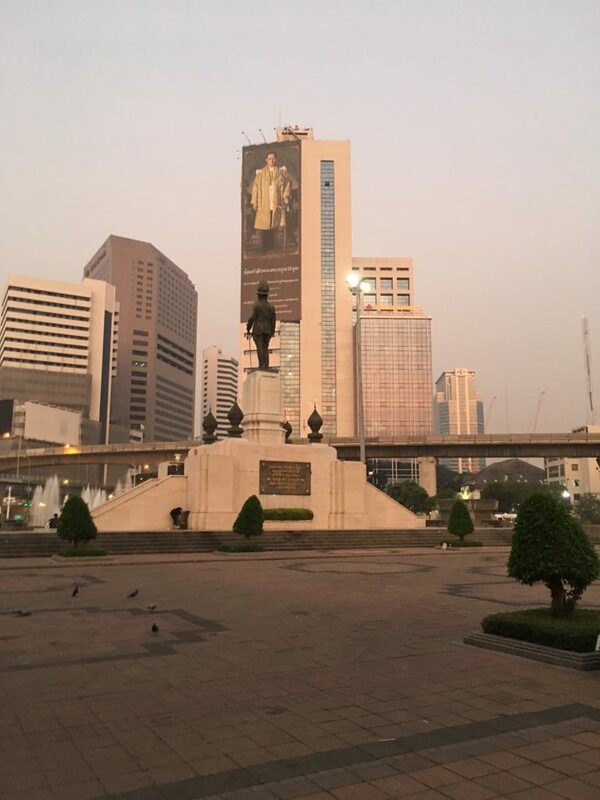 Charles invited me to join him on his weekly Sunday morning run at Lumpini Park at 6:15am. It didn’t bother me that I landed only a few hours before and got only a few hours of sleep. 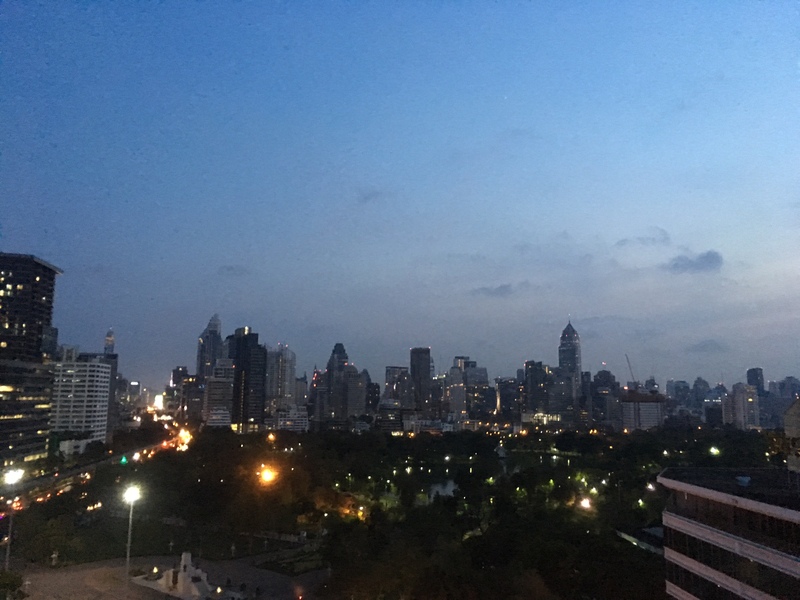 We met in front of Dusit hotel at 6:15 and began our workout. It had been almost a year since we last saw each other. Our mouths worked faster than our feet did. 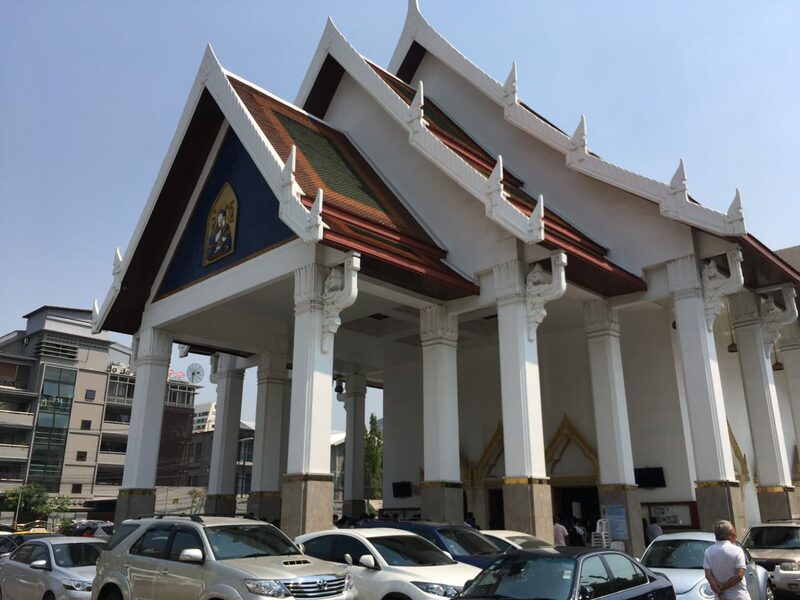 But we clocked in several rounds around Lumpini Park and a total of 10,000 steps. Who needs to enroll in a gym when you have this gorgeous park, with ponds and different types of fitness classes for free from Aerobics, to Tai Chi, Yoga, Running, walking, and what looked like Laughing Yoga. Charles told me it’s a great spot for people watching. And indeed, I encountered a whole motley crew of colorful characters including a man who runs with bird chained to his shirt. The bird would perch on his shoulder as he ran. 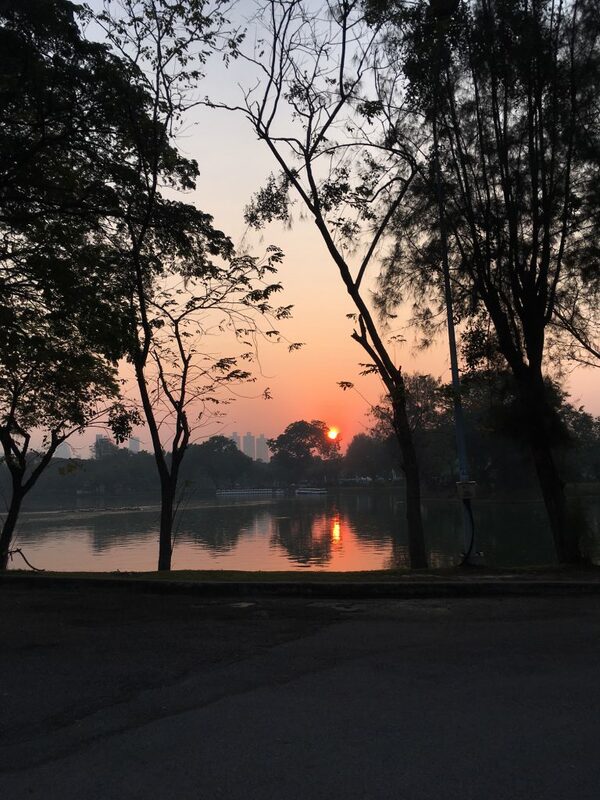 Our reward for waking up at 6am was a serene sunrise in the park. By 8am, we were ready for breakfast. At 8am daily, the national anthem is played and everyone should stand up in respect. So we did. After we indulged in greasy but delicious street-style Thai fried chicken. We also each had a sweet (mung bean) and savory bao (charsiu), all washed down with a beetroot, pineapple, and apple juice. By 8am, we were ready for breakfast. At 8am daily, the national anthem is played and everyone should stand up in respect. So we did. After we indulged in greasy but delicious street-style Thai fried chicken. We also each had a sweet (mung bean) and savory bao (charsiu), all washed down with a beetroot, pineapple, and apple juice. Sundays for me are a sacred time to pray and give thanks. It didn’t matter which country I was in. So, Google maps told me to take two BTS stops from my hotel and take a cab or walk for 29 minutes. While 29 minutes is an easy walk, it was scorching hot at 11am. I asked two cab drivers to take me there, but after much charades showing them my destination, they declined. So I walked, and walked, and walked, even if my feet were burning hot. I finally arrived to the choir singing Lead Me Lord, a fitting song for a traveler writer with a bad sense of directions. All around me were an internationally diverse congregation including Filipinos, Thai, Caucasians, Africans, and Indians. But some how I felt right at home. The songs were all familiar songs I used to sing with the choir I belonged to in Singapore. 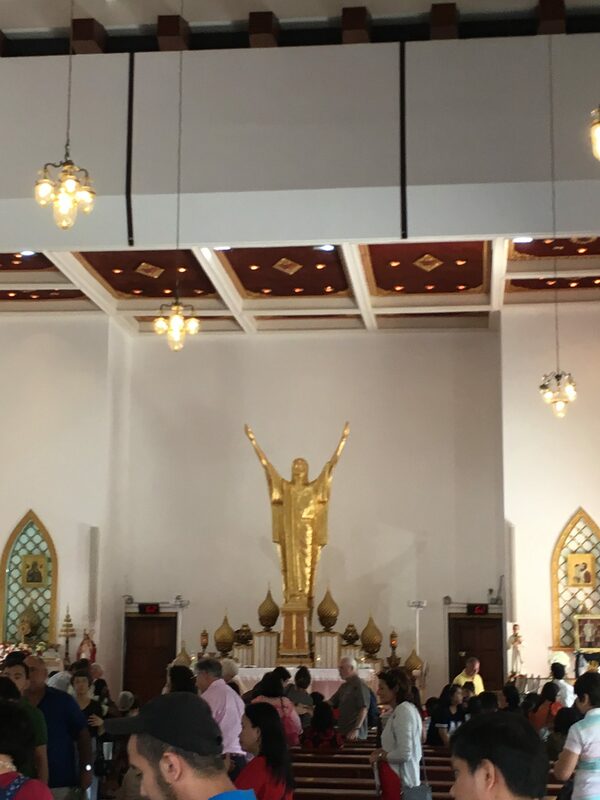 Then, when I received communion, I saw a familiar face- an officemate I last saw 20 years ago when I worked in advertising. Arvin kindly drove me to my next destination, never mind if his house was very close to the church. I left the church sweaty, but feeling as if I got a great big hug from God and the universe. Bangkok is brimming with hotels and buffet offerings. For brunch, Charles invited me to sample Amari Watergate’s latest offering, Amaya Food Gallery. Working for the Amari, he told me of their new food gallery with numerous live cooking stations, a cheese room and where every corner was designed with social media diners in mind. 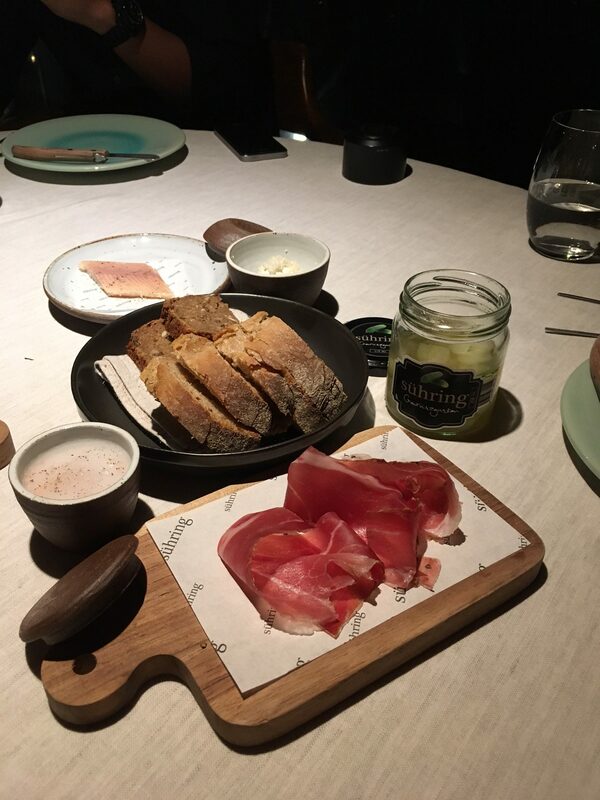 Yes, it is very Instagrammable. 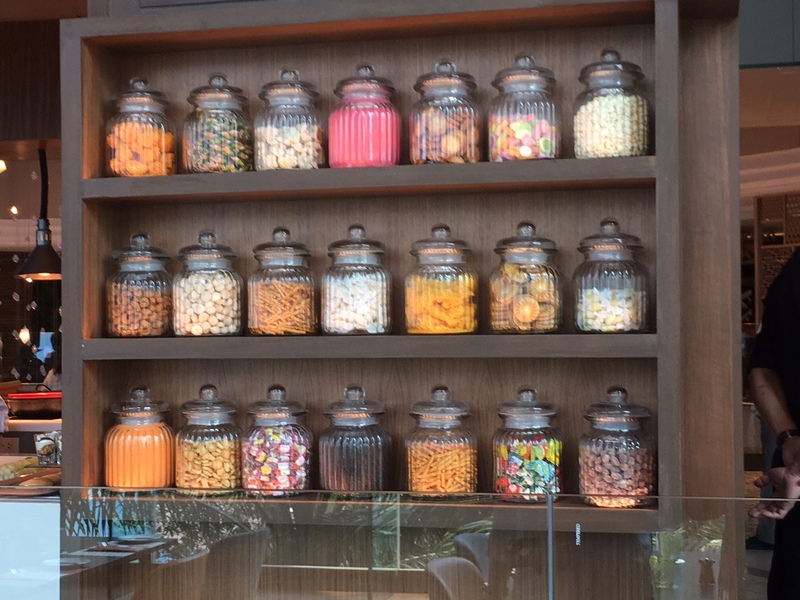 I am no millennial, but I was delighted with the design: high ceilings, bright interiors, and the jars filled with colorful edible sweets. 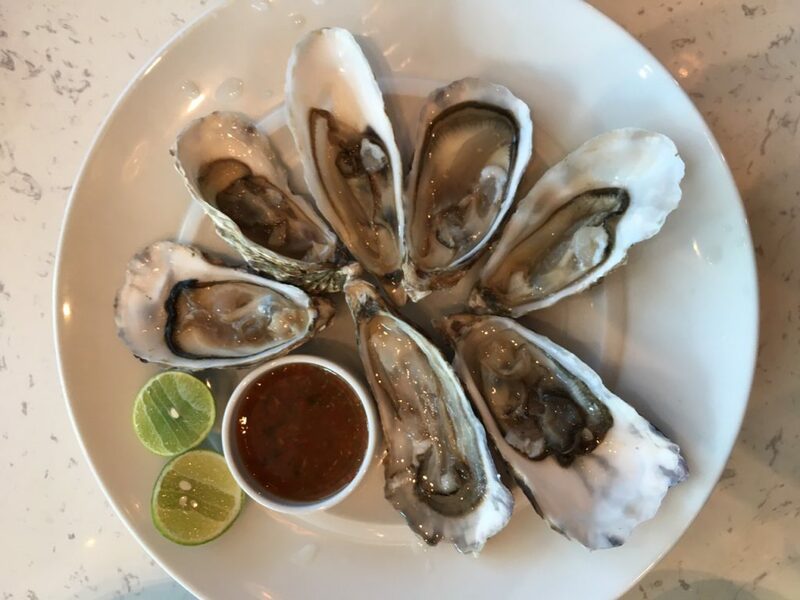 The freshly shucked oysters and the bounty of Alaskan King crabs delighted me. To my surprise my friend and Singaporean dining companion Charles does not eat crabs. “I don’t get it, Maida,” he explains. It’s too much work for a little bit of meat. “You mean you don’t eat Chili Crabs, and Salted Egg Crabs?”, I asked in shock. “No,” he answered. I piled several pieces of Alaskan Crab claws on my plate. And with ease, I ate the crab. After watching me eat several pieces, he then said, “You make it look so good.” So, I handed him the piece I had just peeled. He ate and was instantly hooked. “My work here is done,” I silently thought to myself. The food gods would nod in approval for my good deed in converting a non-crustacean lover into one. 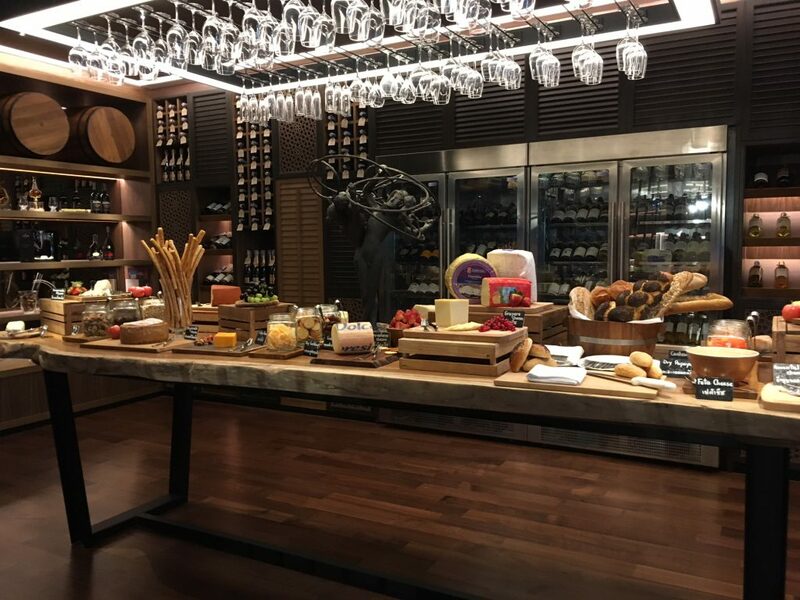 I was not enticed with desserts as much as I was I blown away by the enormous cheese room. It had an impressive spread of Taleggio, Asiago, Formaggio, Forltina, Stagionato, Provolone and so many types of Fromage. I was in cheese heaven. 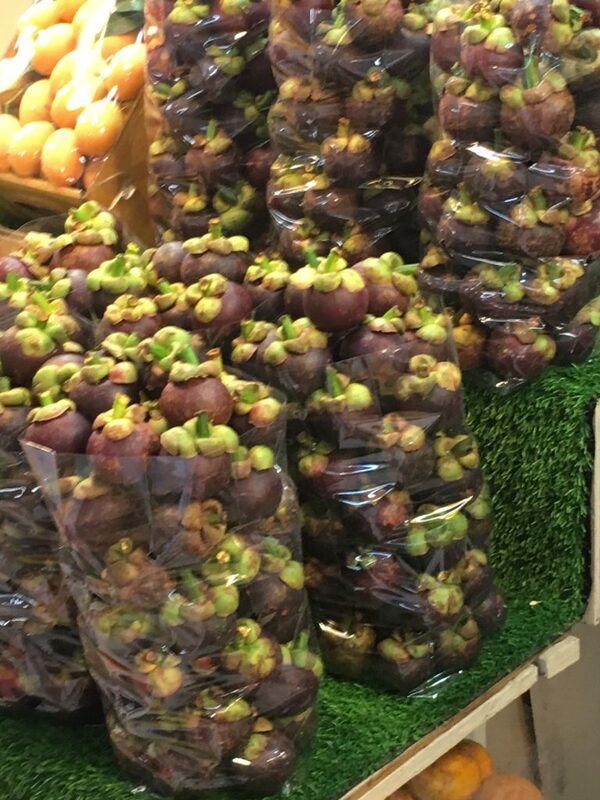 We walked off the calories with a trip to Or Tor Kor Market. 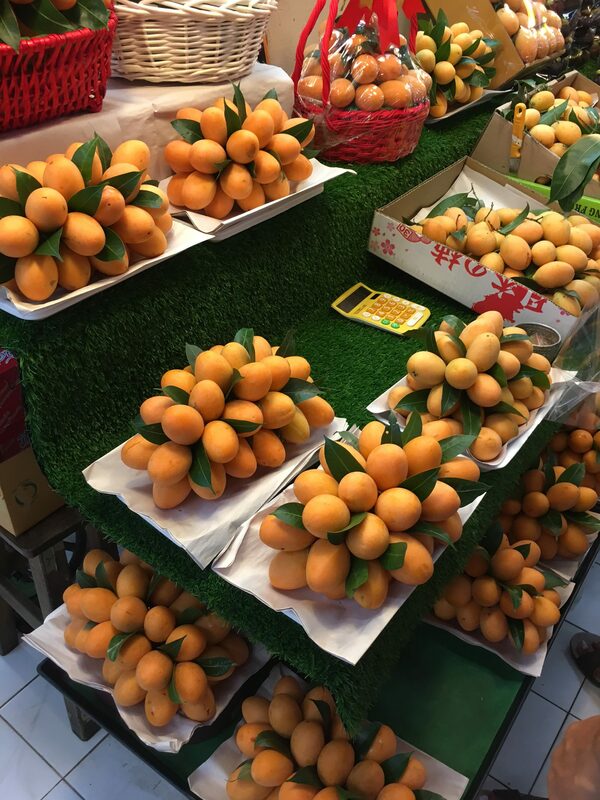 Many foodies and travel guides insist this market is a must visit. But arriving here on a Sunday afternoon, it was quiet. No doubt it was large and immaculately clean, with neatly piled tropical fruits like my favorite Mangosteen. We walked around. I found some cheap retro spoons and forks perfect to eat my fruits with, and a happy way to remember this day. 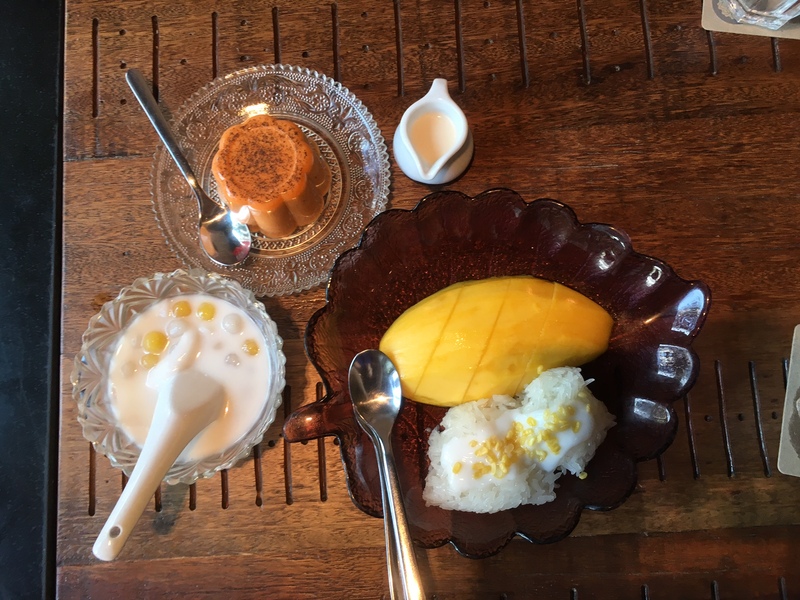 Bangkok is positioning itself alongside Singapore and Hong Kong as Asia’s culinary capital. 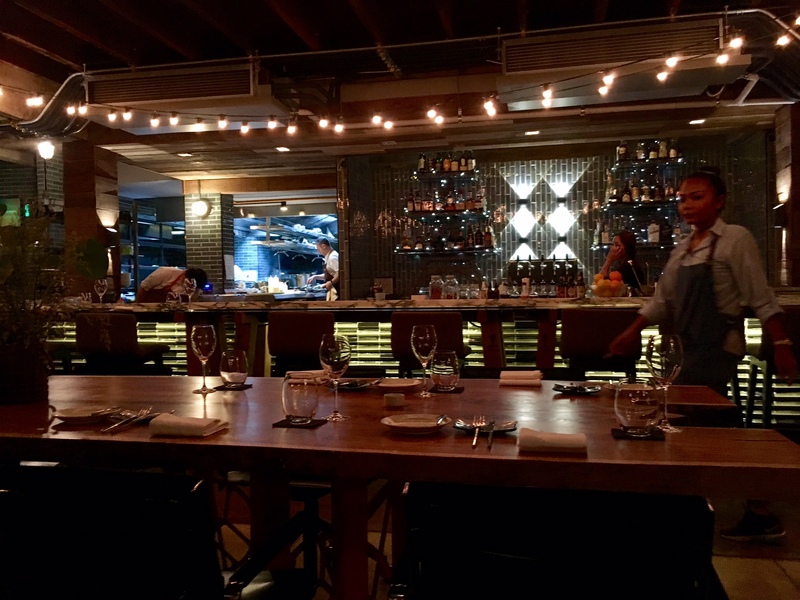 Restaurant openings are aplenty in this city. 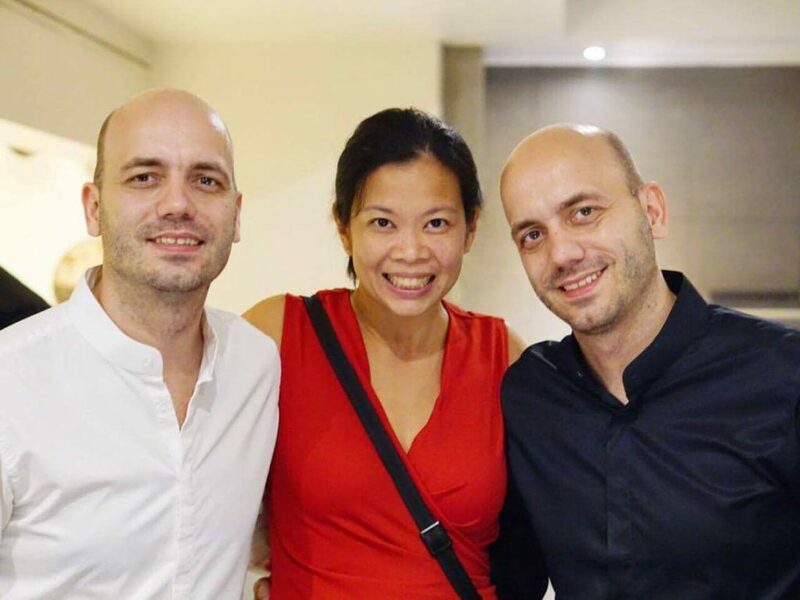 Two years ago, there was an influx of Michelin chefs who migrated to Bangkok to open restaurants. 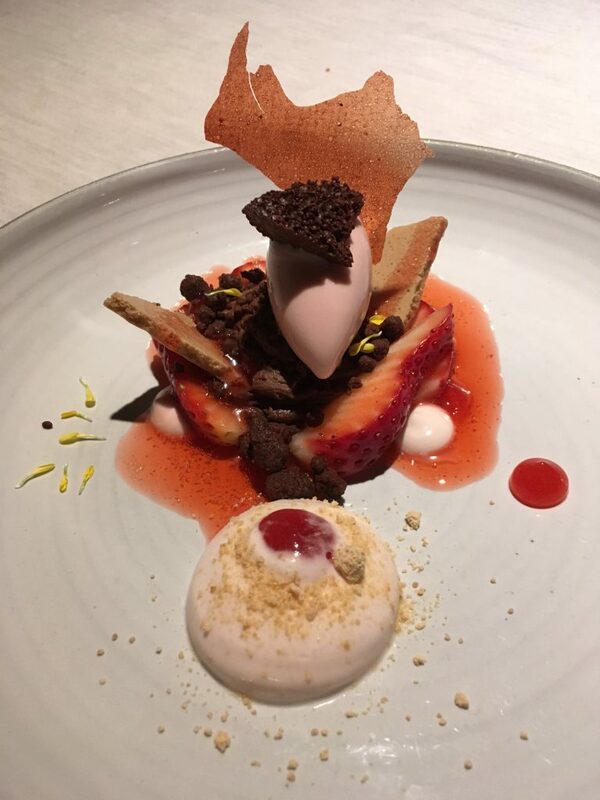 In the past few months, there is now an unexpected interest in new modern German, modern Australian, and modern Italian cuisine. After reading up on my options of new restaurants I was endeared by Freebird. 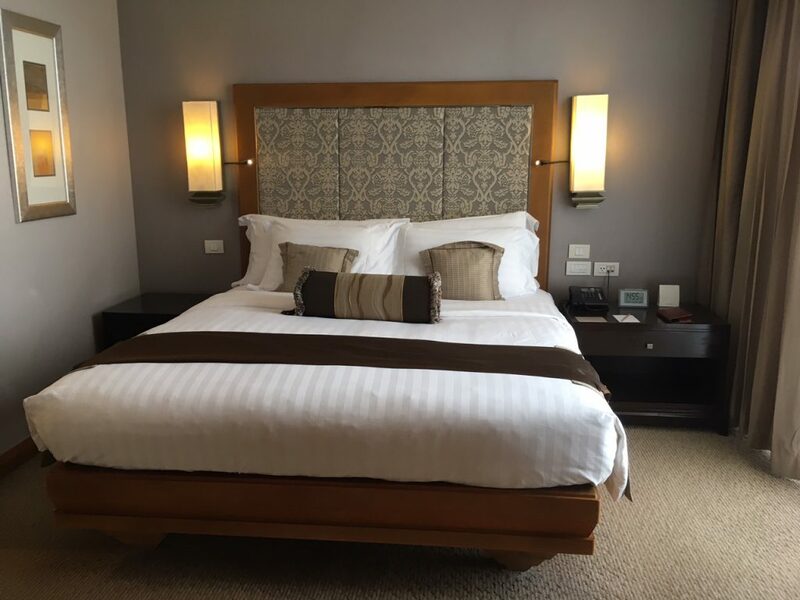 It also has an efficient online booking system (ideal for international visitors like me) with frequent text and email reminders. 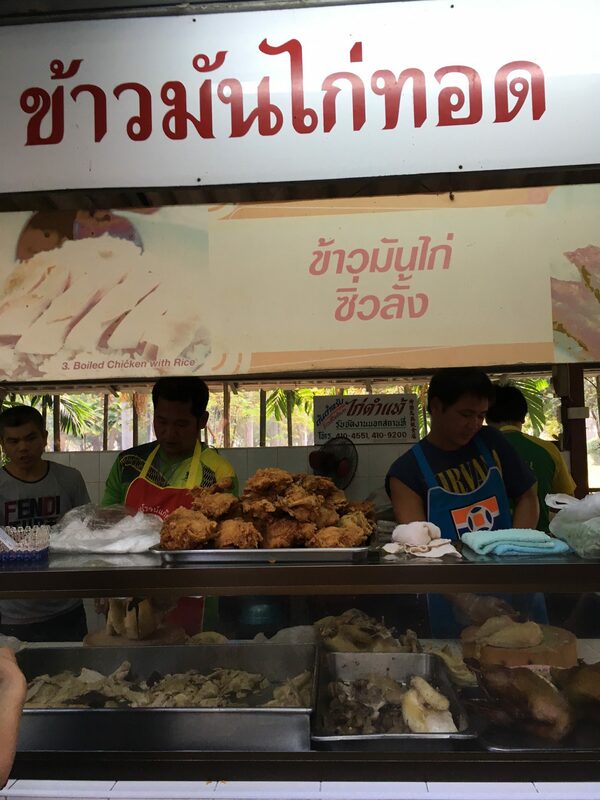 The restaurant was located at the end of an otherwise quiet soi. The light from the open kitchen clearly visible from all the glass windows was like a mirage in the dark Bangkok evening. 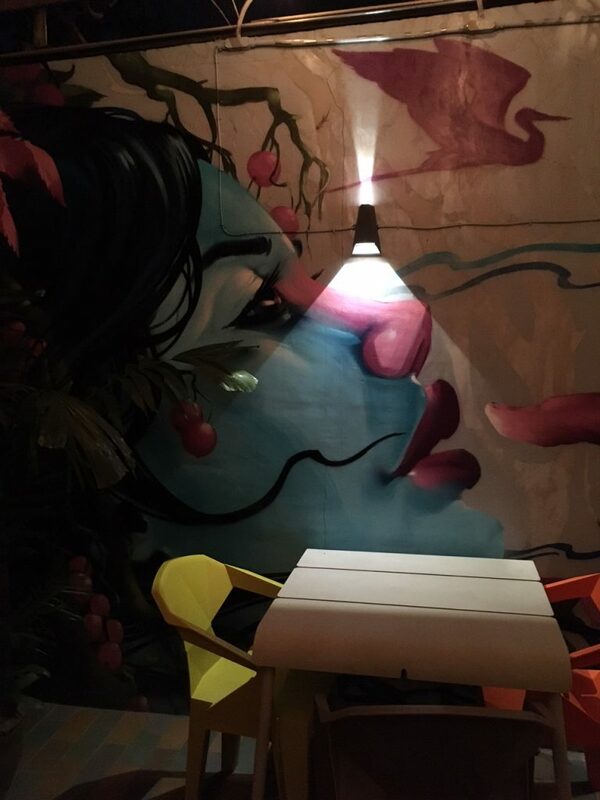 A large graffiti art of a bird on a container van greets you, then a mysterious lady painted on the wall leading into the restaurant’s garden. Designed as different sections to give you a different dining flavor from al fresco garden setting, to cozy modern industrial bistro feel inside to a charming function room upstairs. Love is in the details. The legs of some dining tables were from old sewing machines. The bathroom tiles were so pretty. The service was spot on. The waiters knew the dishes well and quickly refilled water glasses. They were attentive but not hovering over their guests. From breakfast to brunch to dinner, my dining companion and friend Charles. Thrilled too that I hit 30,000 steps with him today. We had the Organic Sea Urchin with flaxseed cracker, Parmesan Custard, and Sea Grapes to start. Delicious, but the custard overpowered the sea urchin and sea grapes. Our mains didn’t disappoint. We shared the Kurobota Pork Collar with Charred Cabbage, White Onion, and Carrot along with the Duck Breast with Mushrooms, Beetroot, and Cauliflower Puree and Mustard Seeds. I love my vegetables, so naturally we needed veggies in our meal. The Cos Lettuce with ‘Caesar’ Dressing, puffed grains, egg yolk cream, and shallot was their modern version of the Caesar Salad, beautifully plated like a flower arrangement. 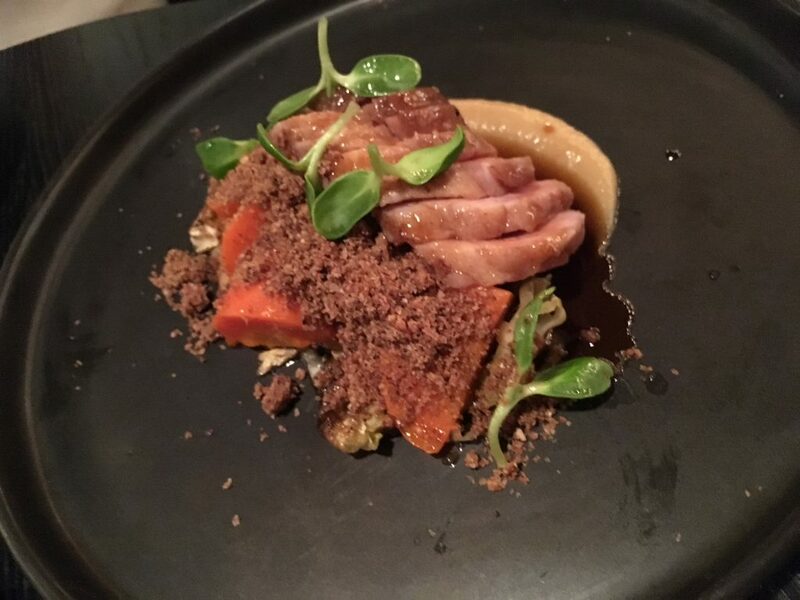 While many may dumbfounded by what is Modern Australian Cuisine? 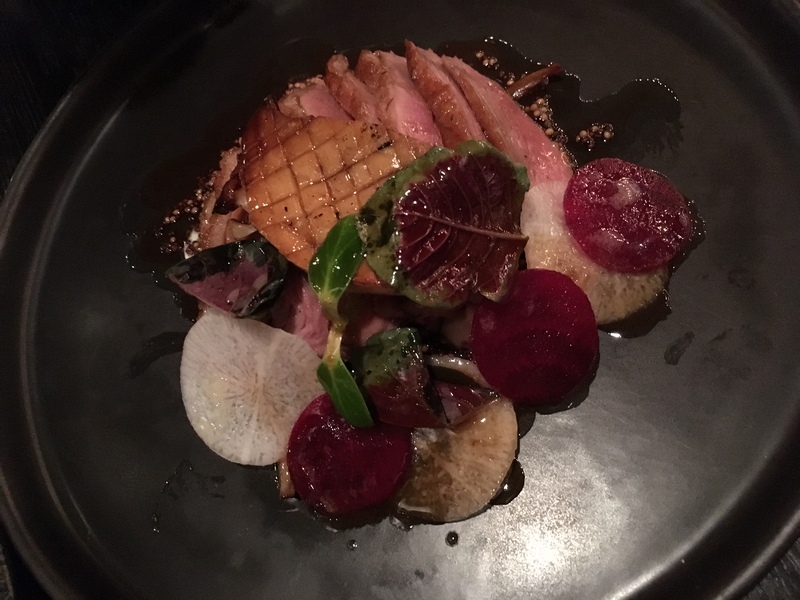 To me, it is how the Aussie chefs cleverly showcase fresh produce in their dishes. 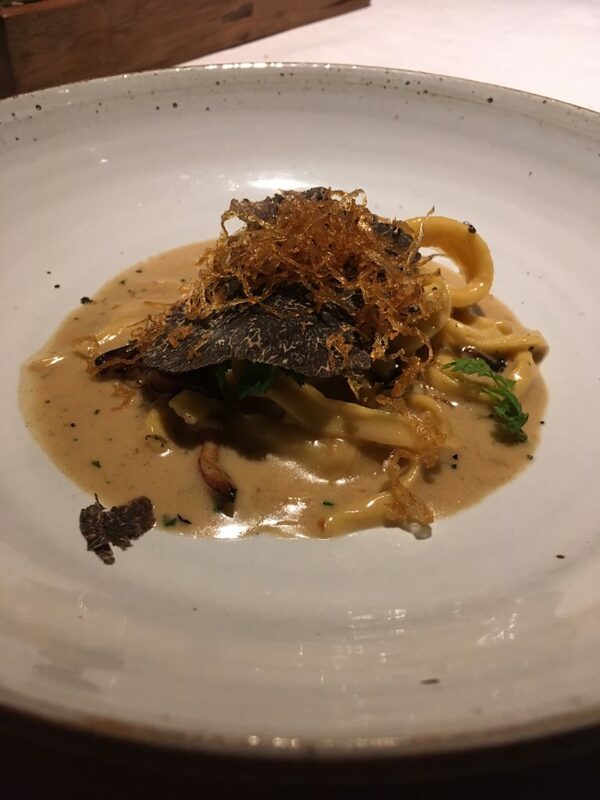 Chef Dallas Cuddy from Melbourne does this masterfully with the mains. He is also very approachable and warm. 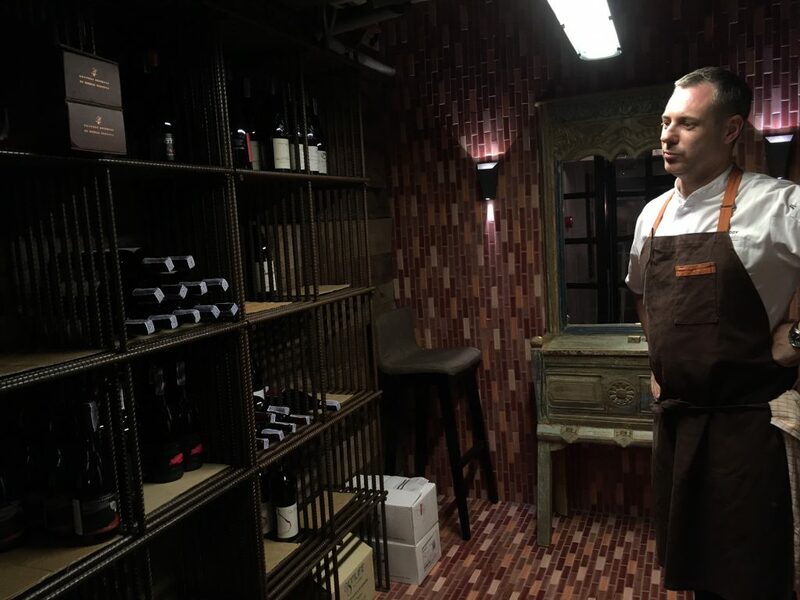 He kindly showed us the second floor, where the private function room is located along with the cellar. 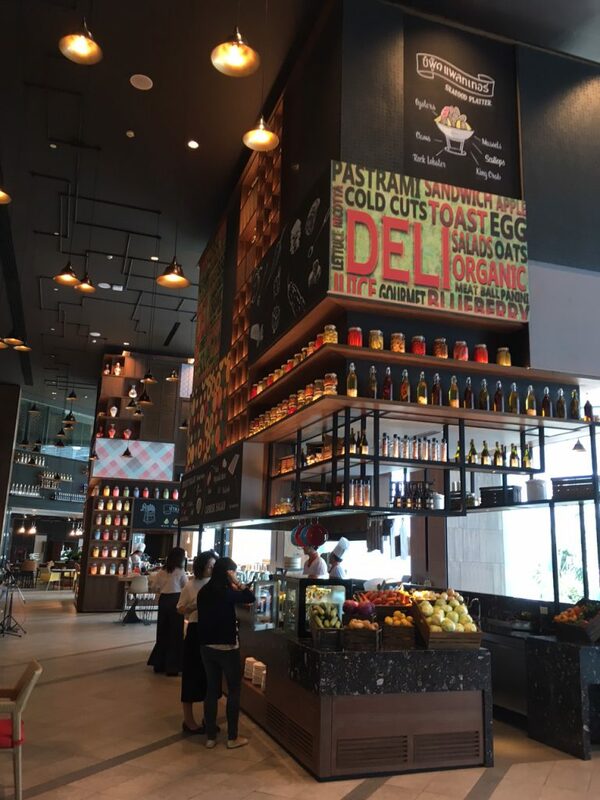 The hip and cohesive design was by Greymatters, a Singapore design company also behind this restaurant. Chef Dallas shared they have garden parties on some weekends. Chef Dallas showing us their cellar. Even their cellar was pretty! Before we parted, Chef Dallas explained the restaurant’s name. For 27 years, the caretaker of this property has been taking care of local birds that live in the garden and nearby area. The birdman continues to reside in the property. Chef Dallas also shared their garden parties scheduled on some weekends. Charles suggested I stay so we could go. But I sense a great energy from Freebird and expect more exciting dining experiences from this restaurant. One thing is sure, I left feeling satisfied, and wanting to return again. Last year, Charles promised to take me to Lay Lao Thai-Esaan Food. It was his favorite restaurant at the time. He admitted to eating here every week. But due to limited time, we settled on squeezing in a quick dinner instead at rival Somtam Der close to my hotel. This year, Charles and I made good on our Lay Lao dinner date. 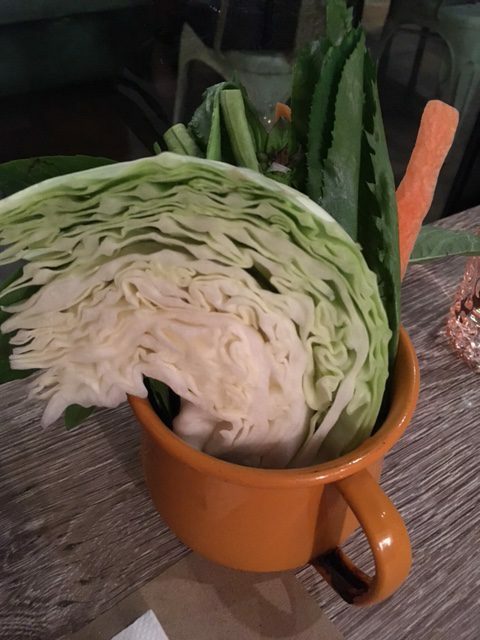 Who needs a floral arrangement when you have this cup of veggie goodness, essential to Isan dining? 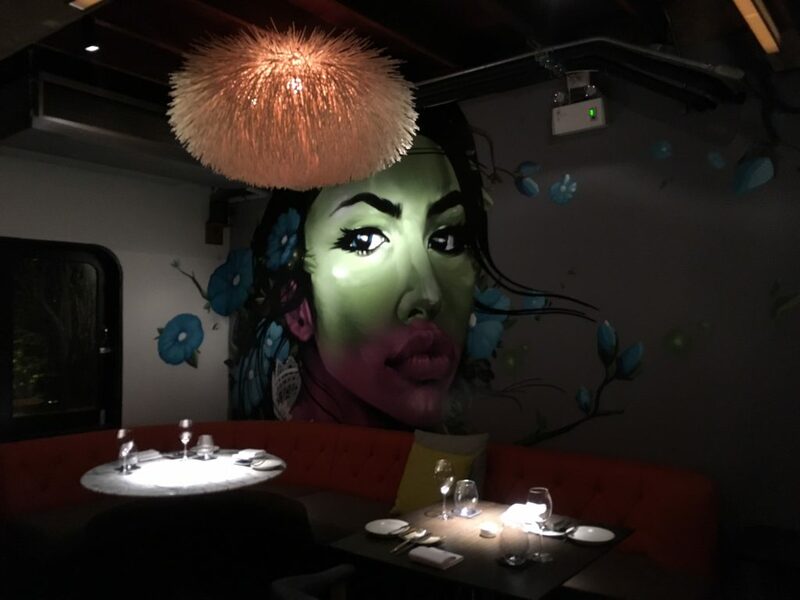 The reviews said the restaurant’s interiors is a favorite among young ladies. I could see why. It was adorable. 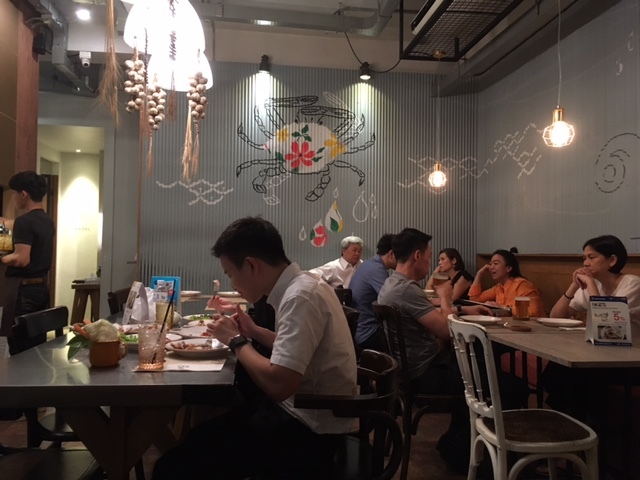 The interiors were simple using corrugated metal walls, with the ubiquitous fermented crab ingredient somtam painted on the wall. It was warm and cozy. I was the the only tourist, unlike Somtam Der brimming with tourists. This was a less stressful, quiet local dining experience. 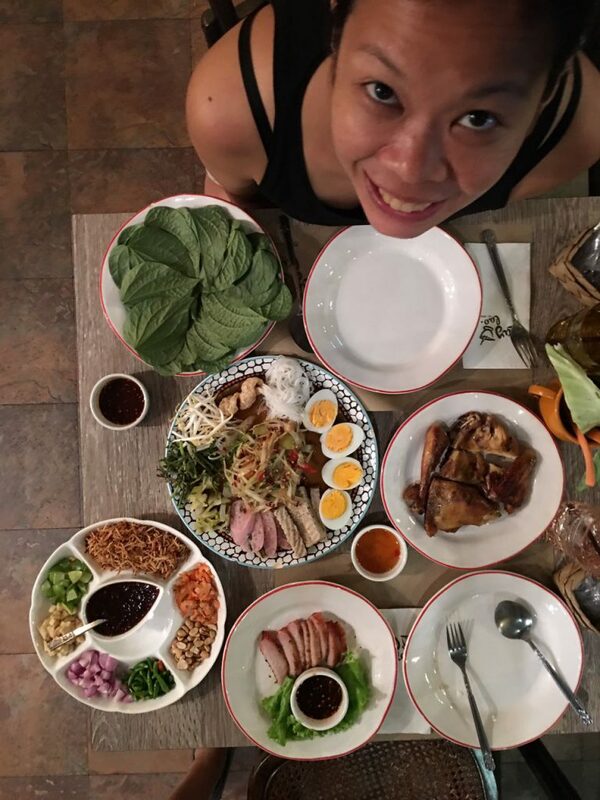 We had the Somtam with Fermented Fish Sauce, in a Big Plate with Lay Lao’s Signature Side Dish half-boiled Egg, Boiled Vietnamese Sausage, Thai Style Pork, Rice Vermicelli, Pork crackling and warmosa,and pickled cabbage. I loved the Pork Neck last time, so we had the Charcoal Grilled Pork Shoulder and the Thai style fried chicken. But my favorite had to be the Miang Kum, this wonderful salad of dried shrimp, banana blossoms, shallots, chili, lime wedges with skin, garlic, and peanuts, with sauce, packed into a Cha Phlu leaf. The blend of sweet, sour, spicy, salty and the medley of textures was just refreshingly delicious. It hit the spot. All that food for for two people, and yes we finished it! 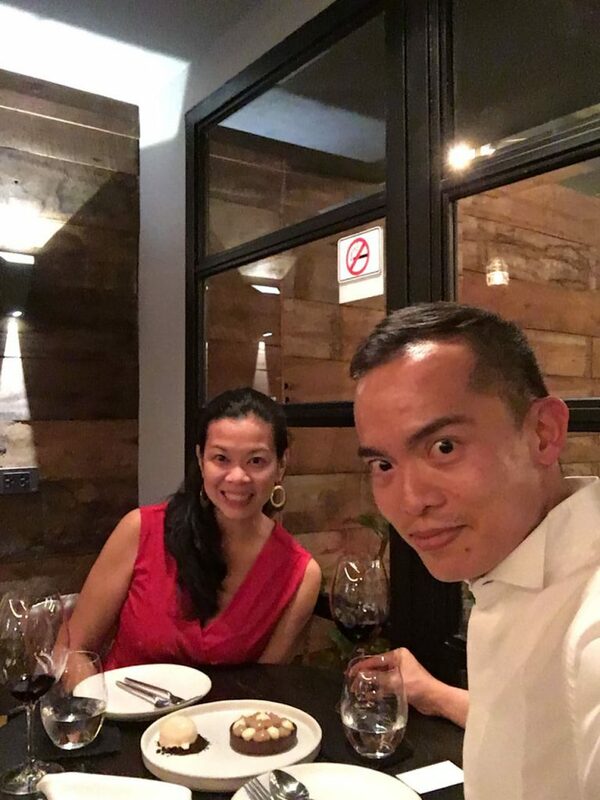 Granted that this Filipino has a lower tolerance of spiciness than the Thai or my Singaporean dining companion, I loved the meal. The use of fermented fish and crab was not foreign to me. Filipinos use Bagoong Balayan paired with boiled or grilled vegetables and fried fish. But I have to admit part of the charm was dining away from the usual touristy picks, and being more immersed in local tourist culture. There is a quiet joy in walking in local neighborhoods and finding little things like this adorable heart shaped cactus. 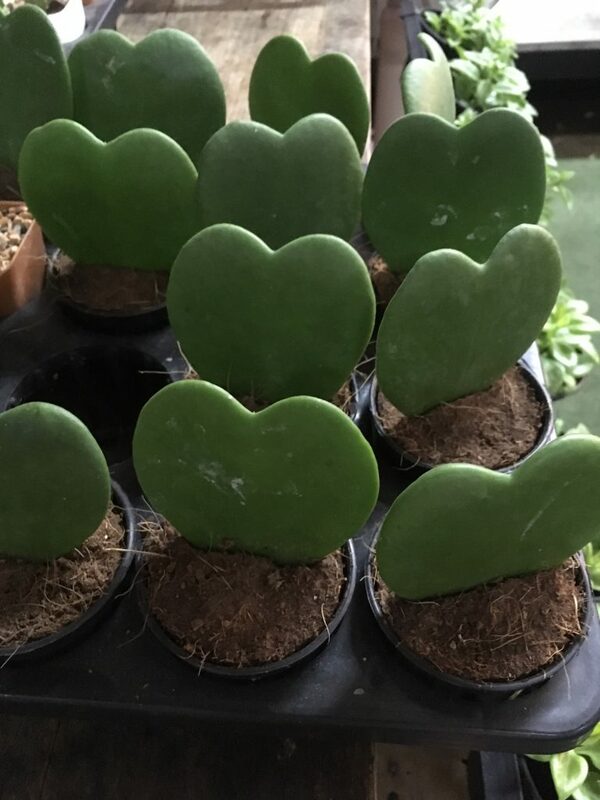 Adorable find– heart shaped Cactus! Unless you have a Thai friend, it is unlikely to have a home cooked me during your visit to Bangkok. But if you are tourist like me only in town for a few days, Supanniga Eating Room will sort you out with traditional home style Thai dishes in a hip and trendy restaurant. Hot and hungry, I was ready for lunch at Supanniga Eating Room. It did not disappoint. The Pla Too Tod Nam Pla is a simple fish dish. It is simply wok-fried Thai mackerel seasoned with premium Thai fish sauce. It is reminiscent of the fried Galunggong served in many homes in the Philippines. 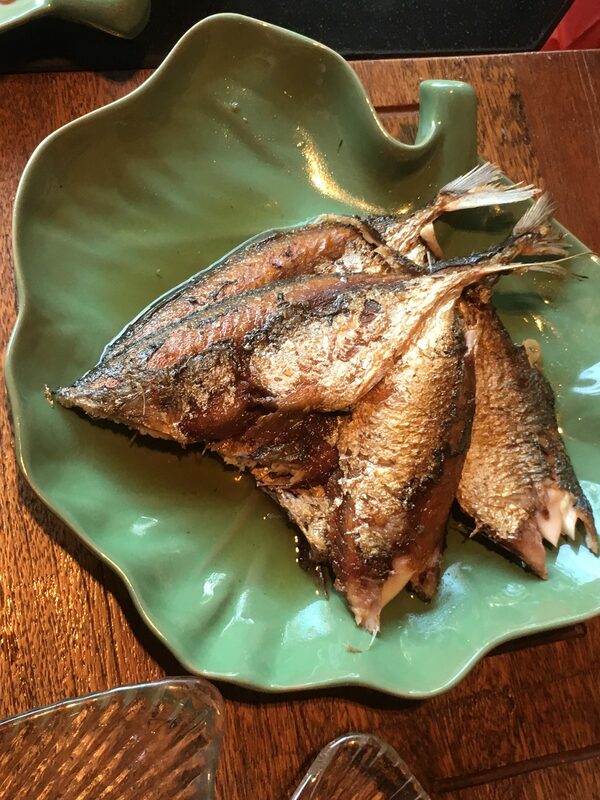 My Filipino companion said, “My mom would laugh at us eating galunggong in Thailand.” But honestly, I would eat this in a heartbeat. It is delicious. It is perfectly paired with Ka Lum Tod Nam Pla. 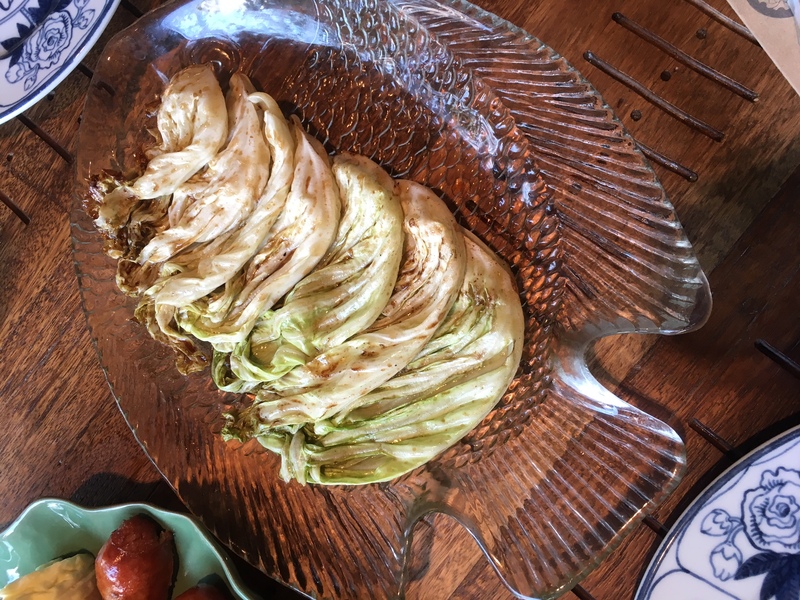 It is fried Chinese cabbage with premium fish sauce from Trad province. 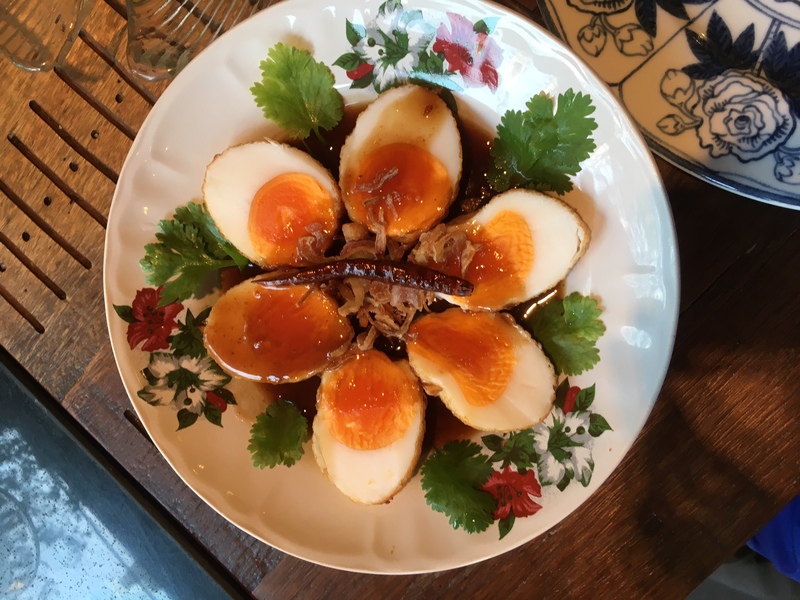 We couldn’t leave without trying the Son In Law Eggs (fried medium boiled eggs, served a sweet, sour, salty sauce and fried shallots). These three were my non-negotiable dishes, and I’m glad I ordered these. 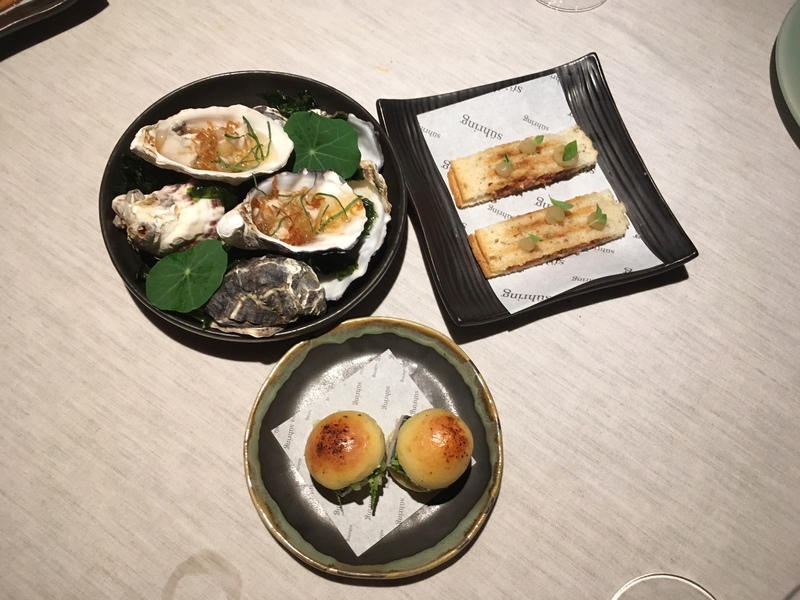 My companions ordered other dishes, but I would return just for these three dishes. Pla Too Tod Nam Pla, must order this fish I’m still dreaming about. For dessert, we tried a few. But only the Thai Tea Panna Cotta Stood out. With every bite, I felt like I was in our family home eating mom’s cooking. Even the serving plates were reminiscent of the those my mom used when I was a child. Granted, I am not Thai. But I’d say any Southeast Asian would feel right at home here. My only wish now is for me to eat here every weekend. Admittedly, I don’t know much about German food other than sausages, sauerkraut, pork knuckles, and pretzels. 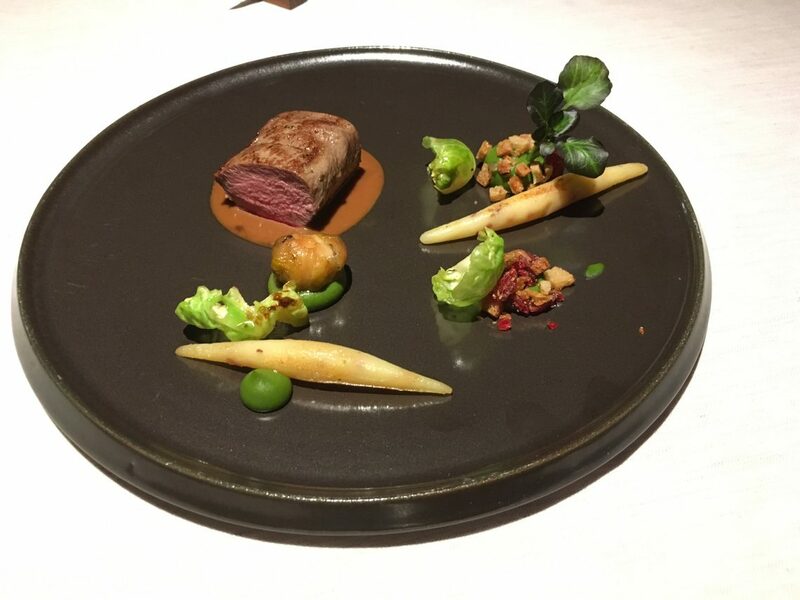 But my curiosity was piqued by Suhring, a modern German restaurant that ranked number 13 in this year’s Asia’ 50 Best Restaurants 2017 list. What a feat, considering it was barely a year old, having just opened last March 2016. But the Suhring twins have Gaggan Anand’s approval. 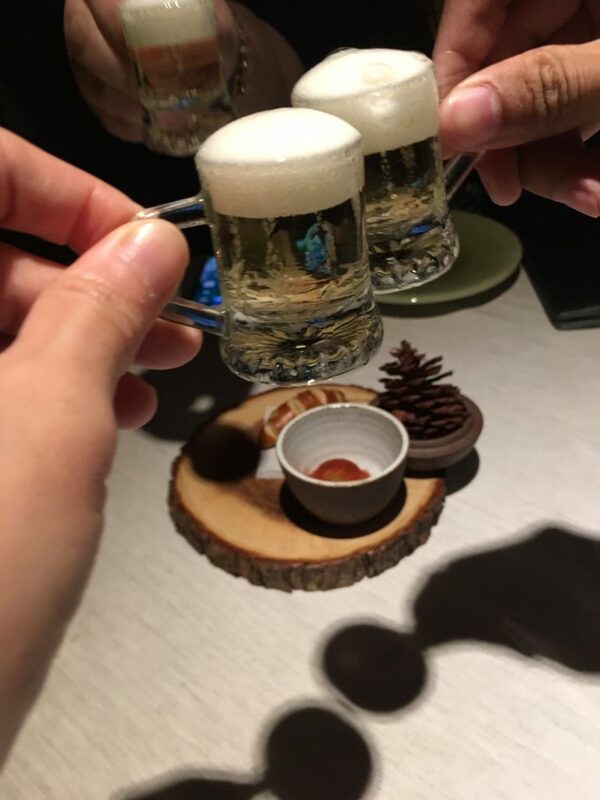 Asia’s Best three-peat Restaurant chef of Gaggan is an investor behind this new German restaurant. 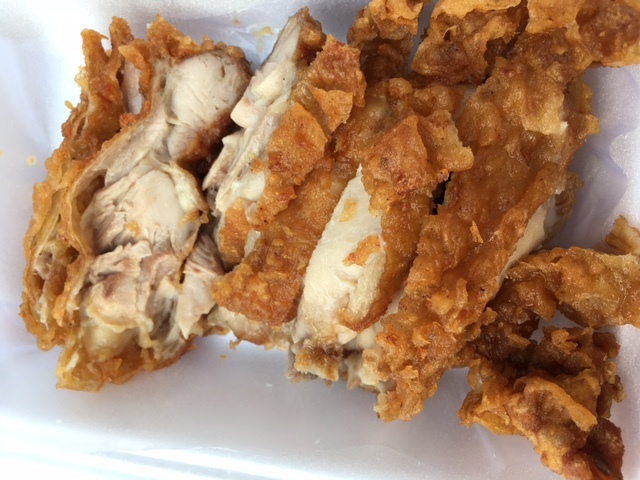 With an open mind and a hearty appetite, I boarded my grab Car into the out-of-the-way restaurant located in the residential area of Chong Nongsi. It was a quaint and quiet place,probably too romantic for our motley crew of four noisy food writers. We opted for the 8-course Suhring experience. 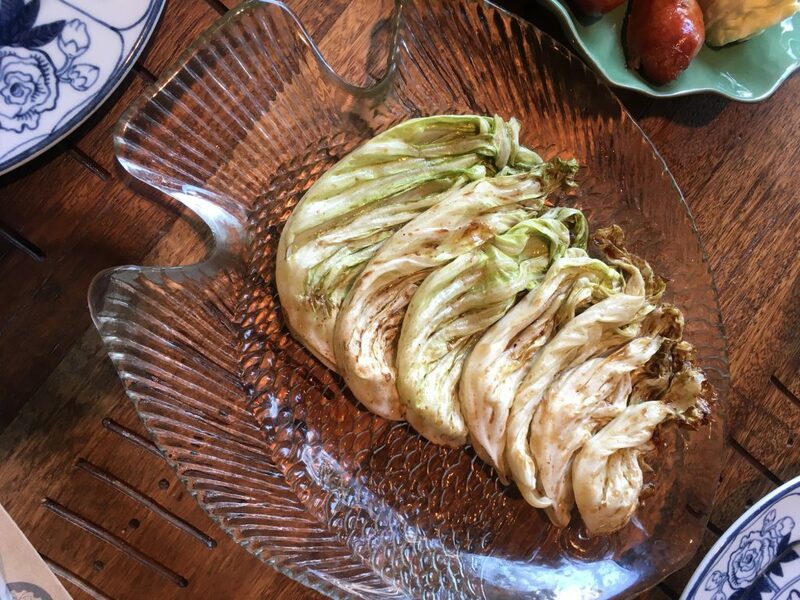 The twin chefs pull from their childhood experiences in their grandparents’ farm fermenting, pickling, smoking, drying and curing and elevate it to haute cuisine. 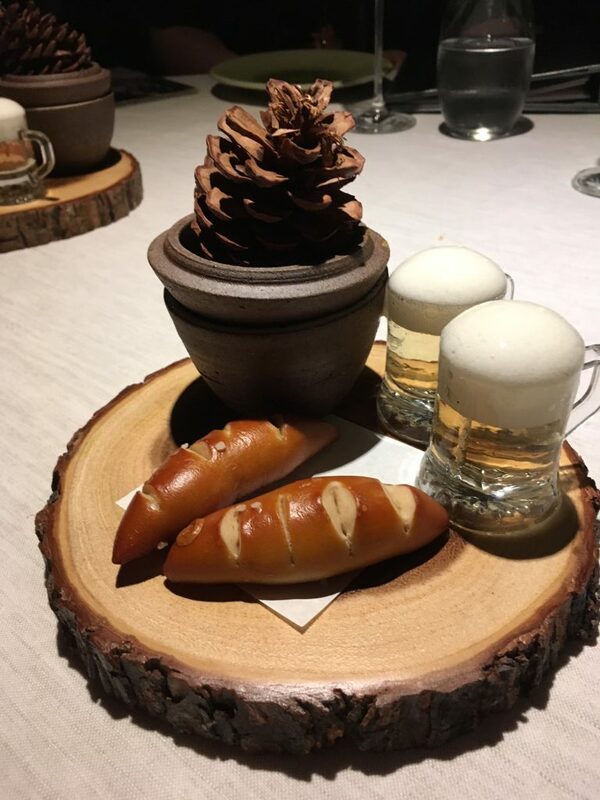 Starting with the Soft-pretzel and Obatzda, Herrings Brotchen, Oyster and Beer Vinegar— it almost looked to adorable to eat. Too adorable to eat. But yes, it was delicious! Desserts were beautiful but most satisfying was Grandma’s Eggnog. Meeting Thomas and Mathias Sühring in their kitchen was a delight. While every single diner probably tries to decipher the twin brothers apart, they chefs still kindly indulge their guests in this game. But their staff admit it took them months to tell the two brothers apart. There is a warmth and coziness to the restaurant. It is after all an extension to their home. Mathias lives above the restaurant, and Thomas lives next door with his family. You leave the restaurant feeling as if these two chefs had just invited you to their home for dinner. I believe you attract what you desire. With every meal I was nourished with what I truly hungered for: an early morning jog at sunrise, indulging on a Sunday brunch with a friend to partaking in Modern Australian cuisine at Freebird, to delighting in Isan food at LayLaoAree, finding comfort food in Suppaniga Eating Room, and delighting in discovering what Suhring’s Modern German cuisine. 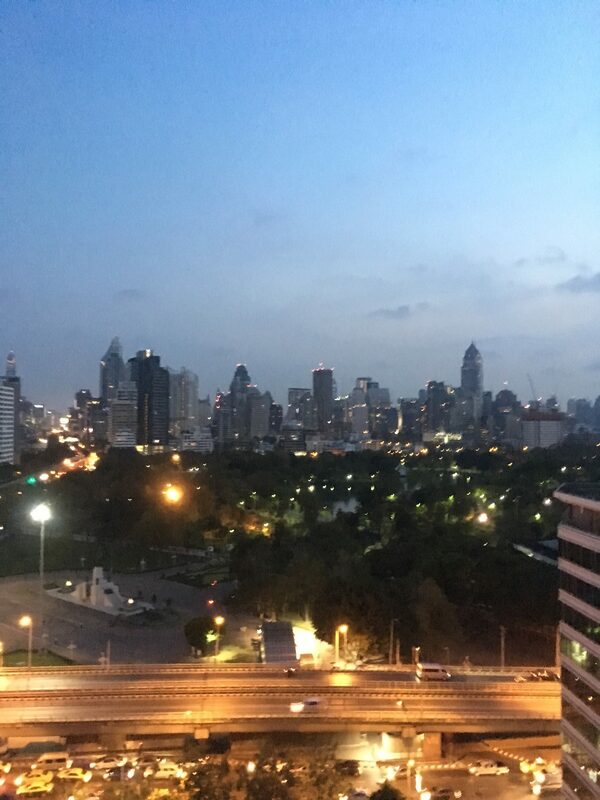 On my last day in Bangkok, I took some time to watch the sunrise from my bed at the Dusit Thani Hotel. From my room, I could see Lumphini Park. Looking at the city below me, there was still much to partake. I headed to hotel’s gym to workout then proceeded to do sun salutations and yoga stretches by the pool. We stretch to keep our muscles strong, healthy, and flexible. If you don’t stretch, your muscles shorten and become tighter. They become weak and unable to extend all the way. As I stretched my body, I realized that travel stretches the mind with new experience. Travel gives me fresh eyes, not just to see new things, but also gives me a new mindset to see my reality. In unfamiliar territory and with a language you don’t speak, you get out of your comfort zone to get what you want. But all my years as a traveler taught me this: the world kindly provides what you desire. 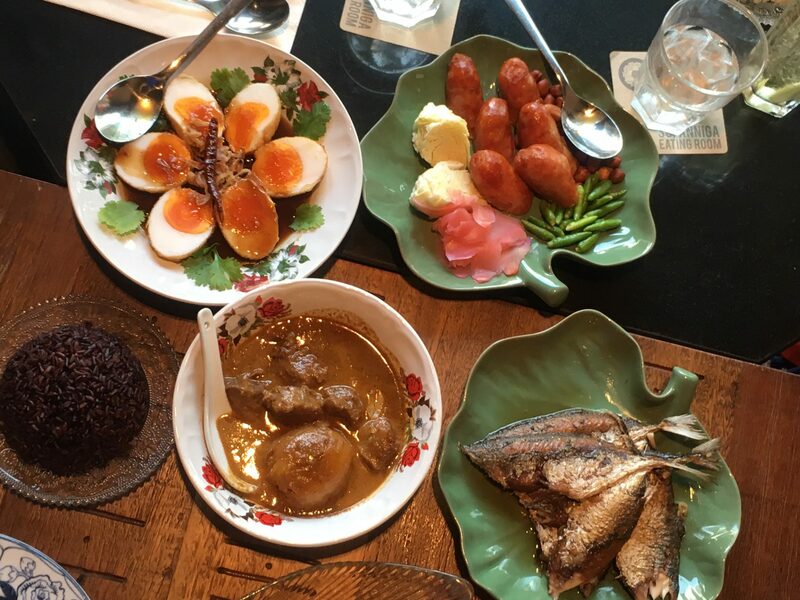 The few days in Bangkok may simply seem like a food trip. But for me, it was much more. It was exactly what I longed for and feeding my spirit. It was about celebrating friendship, where you find yourself laughing till you cry. It was finding the familiar in the foreign. It was delighting in new experiences. It was relaxing and trusting the universe will provide. It was a great big hug from the universe reminding me all shall be well, and it is remember Bangkok with a smile on my face and a desire to return. My dear travelers, don’t fret when you travel. Take it easy. Honor who you truly are and what you enjoy. Feed your spirit. Trust you will be nourished. I promise your trips will be richer and more rewarding. Please follow me on Instagram and Facebook for more delicious adventures. Thanks for journeying with me!